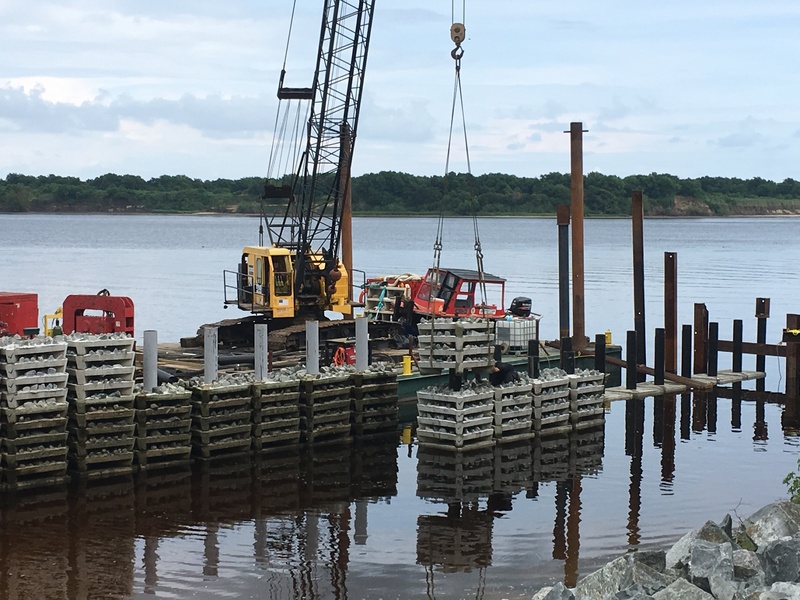 Atlantic ReefMaker installation for Phase 2 of the Brunswick Town/ Fort Anderson shoreline stabilization began during the week of June 18, 2018. Phase 2 extends down river from the initial Atlantic ReefMaker installation along Battery A, which was completed in August 2017. When completed, Phase 2 will arrest shoreline erosion for 240 feet of the historic site. The Phase 1 structure was ‘over-engineered’. In cooperation with the resource agencies, the height of the structures was greater than required. There was an agreement with the resource agencies that the structure would be monitored during large storm events, like hurricanes, and that the Phase I structure height would be reduced in Phase 2 to accommodate typical wave energy for mean ordinary high tide. Phase 2 involves removing the ‘extra’ ecodiscs from Phase 1 structure in order for the structure height to be 1 foot above mean ordinary high tide. The repurposed ecodiscs will be used in Phase 2 implementation.